Everyone likes some sunny weather. Of course, there becomes a time when enough is enough, right? Nothing can ruin a good adventure like getting too much sun in your eyes! Link spends a good portion of The Legend of Zelda: The Wind Waker cruising through the sunny seas of Hyrule. We bet that he has to do a lot of squinting while manning his boat, but that’s just because he couldn’t find a pair of sunglasses that fit his unique, Hero of Hyrule kind of style! Well, now there’s finally a pair of officially licensed sunglasses from Nintendo that he can wear. And guess what! You can wear them too! These Zelda Link Sunstaches are a pair of novelty sunglasses that will have you ready to face off with the shining rays of the sun in style! The frames are shaped like Toon Link’s face, complete with his bright blonde hair and his green hat. They even have his pointy little ears poking out of each side! The lenses are tinted and feature UV protection. 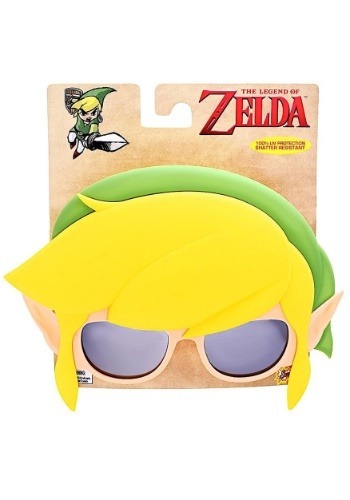 These sunglasses are great if you plan on heading out on an adventure in Hyrule, or if you just need a pair of rad shades to protect your eyes from the sun!